We are all part of the “in” Crowd! The Israelite people had always believed that they had a special, unique relationship with God. They also believed strongly that clear boundaries existed that stipulated who was “in” and who was “out”. If you were born of the line of Abraham, you were one of the chosen people and belonged to that special “in” group. Anyone who was foreign born didn’t quite measure up. The book of Ruth shows us however, that God does not care about birth or ancestry as much as He cares about commitment and obedience. Ruth is a foreigner, a poor widow from enemy land. And yet, God uses her to change the course of history. She becomes the mother of Obed, who is the grandfather of King David, and an ancestor of Jesus Christ. What do we learn from Ruth’s story? We learn that God can use any one of us–no matter how weak, how poor, how insignificant we might look to the rest of the world. God cares about all people, no matter where they were born or what color their skin might be. We learn that we matter to God. God’s hand is all over the events of this book and nothing in the lives of Ruth, Naomi, or Boaz escapes His notice. God provides protection and provision of their daily needs to Ruth and Naomi. And He does this for us too. We need to be constantly watching for His hand touching our circumstances so that we can give Him the thanks and praise He is owed. And we learn that God wants us to live selflessly–the way the characters in Ruth did. Ruth cares for Naomi by putting her own needs aside. Naomi cares for Ruth by ensuring her future protection. Boaz cares for Ruth and Naomi by redeeming their property and by marrying the foreign widow whose future seems bleak at the beginning. And God cares for us by giving them a child who would be the ancestor to Jesus Christ. The book of Ruth begins with hopelessness. But we see Ruth join with the people of God and turn her life completely around. Isn’t this a picture of how we come to a faith as well? We begin with no hope–outsiders, foreigners with no place in the family of God. Ruth, the outsider from Moab, laid herself and her pride down on the threshing floor before Boaz, and he became her kinsman-redeemer. We too change our lives, when we lay down our pride and surrender to Jesus, our Redeemer. What makes you, you and me, me? What identifies us? Is it the logo on our shirts, the tattoos on our arms, the clothes that we wear? Is it the things that we have, the work that we do? Is our identity, who we are, more than skin deep? Our identity comes from within and does not always match what is seen on the outside by others. More importantly our identity as believers in God comes from Him. It is this identity that matters and what should determine our success in life. When we see ourselves as God sees us we take our focus off of what others say we are to who we really are. We are the beloved of God, His children, His kingdom kids. Christ dwells inside us and what that means is that we have the power to live life differently, to live as He did. Christ was able to accomplish what He did in his earthly life because He was secure in His identity as the Son of God. If we claim to have Christ within us it means that we have died to self, we have died to all that He died to on the Cross. It is not what we do that determines who we are but rather that what we do is determined by who we believe we are, what we believe our identify to be. Scripture tell us that we are new creations. “Therefore if anyone is in Christ, he is a new creation; the old things have passed away. Behold, new things have come.” 2 Cor. 5:17 As new creations we find our identity as God’s children putting aside believing all that the world says we are and need to be. When we forget who we are, we struggle to live a victorious life falling into old patterns that have caused us failure and pain. When we remember who we truly are, God’s beloved, and that Christ dwells in us we can do all things because with Him all things are possible. Henry Nouwen has said, “You’re not what you do. You’re not what you have. You’re not what people say about you. You are the beloved of God.” It’s not the job you have, the possessions you own, nor the opinions of others that make you who you truly are. It’s who God says you are. As believers, who we truly are changes everything—how we feel about ourselves, how we treat others and how we live. So fellow believer, never forget who you truly are. In his role as guide of the sheep the shepherd guides in three different ways. He guides with tenderness, straight ahead, or from the back. When we read about Jesus as a Shepherd we can see that He employed all of these with His disciples. When they were new to the fold, He tenderly taught them, and showed them the ropes through the things that He did. As He sent them out to the surrounding towns, He would have stood behind them urging them forward to the task He had given them. As leaders and lay we are shepherds and sheep. As the sheep of His fold we need the guidance that a shepherd offers. As leaders we are shepherds to those whom we lead but we cannot lead effectively if we are not willing to be led ourselves. As Jesus’ disciples we are not one or the other but both. We can say that we are not leaders in the true sense of the word but that is not true because being a leader does not mean always being up in front. We are all leaders to somebody whether it is our children or with those with whom we work or play. We often muddle through aspects of this kind of leadership but imagine how much more effective we could be if we asked the Architect of this universe and all that is in it to help us? God alone is sovereign and His leadership perfect. How can we not go to the Master? There are many things that can prevents us from gaining a full understanding of situations placed before us daily. Distractions bombard us from every side vying for attention. Voices clamour to be heard. Just like a shepherd who uses his crook to bring a sheep’s attention back to where it needs to go, we too need help to focus our attention on those things that will keep our eyes firmly fixed on the goal of walking as a disciple is called to do. We require spiritual blindfolds or blinders to block out the distractions. The helmet most pictured in the suit of armour of Ephesians 6 is a full-face helmet with an opening for the eyes in such a way that the wearer’s vision cannot be anything but straight forward. Because we cannot run around with these physical helmets, we turn to what the helmet represents. Firstly salvation, followed by immersion in God’s word seeking understanding through prayer along with regular retreat into quietness with God that brings revelation and rest. God’s voice is most often heard in the quietness. Safety of the sheep depended on the shepherd’s guiding as did the rest that they took in the quiet of the night. In scripture we are likened to sheep. Should we not then take lessons from the Shepherd, to be guided as the sheep are guided? What better place to start than with the Creator of the universe, the true Master Shepherd? John 10 begins with Jesus telling us about the shepherd who calls out his own sheep from the pen where they are mixed with other flocks. This morning as I awoke a cat named Boomer came to mind. He had lived next door to my mother-in-law. He was as home in her house as he was in his own. When his owners were gone he would often come in and sleep on her couch. Without fail he would suddenly want to leave. Over time we noticed that he left just before they arrived home. He recognized the sound of their truck before it arrived in the driveway. By the time they parked their truck he was at their door waiting to welcome them home. Much like Boomer who recognized the sound of his owner’s truck, the sheep recognize the voice of the shepherd and come to him to be led out of the multi mingled flock. In biblical terms we walk in a world of sheep and goats. How well do we recognize the Good Shepherd’s voice when He calls out to us in the co-mingled world in which we dwell, to accept Him, to live like Him, to serve Him? When we have heard His voice that calls us to salvation, do we continue to hear Him or do we allow the lure of the world to drown Him out? We do well when we recognize His voice as the name He gives us gives us our identity and how we are called. Being named and known has benefits. We are adored, blessed, redeemed, forgiven, lavished with grace, and able to know the mystery of God’s will. We are His beloved sheep. Being immersed daily in His word keeps us attuned to His voice just like Boomer was attuned to the sound of the truck coming down the street. The shepherd is considered the lowliest and despised occupation in some cultures but the shepherd and his tools have provided great imagery and symbolism in the biblical narrative. In the context of the shepherd, the staff is an extension of his presence and guidance, a symbol of care for his sheep. The shepherd’s staff is used to rescue sheep from crevices, holes and other places where they have managed to wedge themselves. They are used to guide the sheep through rugged terrain, to comfort them in times of stress, to use as a weapon against predictors and so on. The crook of the staff is a handy tool for these endeavors allowing the shepherd to reach into areas that he otherwise could not. The staff is used by the shepherd to lean on to provide support when tired. The staff serves both the sheep and the shepherd. In the Bible, the staff is a symbol of leadership, and identity. It was common to use them as a walking stick identifying the user as a leader. Moses used a staff to perform the signs before Pharaoh. In Moses’ hands the staff became an extension of God’s arm in dealing with Pharaoh. In context of the 23rd Psalm, verse 4 the staff is a comfort in the times of walking “through the valley of the shadow of death”. It protected from danger, a metaphor for the protection afforded us by the Lord in His role as a Shepherd. The Holy Spirit can be considered as a staff for our comfort. Before Jesus ascended He promised to send the Holy Spirit, the Comforter that would guide the disciples into all truth and bring to remembrance all that Jesus had told them. For us, the Holy Spirit protects us as we walk in the valleys of temptation. He prods us, checks our spirit, encourages us, guides us in our daily walk much in the same way as the shepherd does for the sheep in his care. The Holy Spirit is an extension of our Good Shepherd Jesus to enable us to walk before Him as we should. Where Or Where Could It Be? Have you ever lost anything of value that kept you looking even as it seemed hopeless? And when you found it how happy you were? If you had involved others in the search they were happy that it was found as well. If you haven’t found it, how your mind keeps going back trying to think where it is? Years back helping to supervise a class on a field trip one of the students wandered off and I was sent to see if he was waiting at the spot that was arranged beforehand. Sure enough there he was looking rather sheepish. He was a curious sort and had wandered off looking at something that had caught his eye. A pre-arranged spot made it easy for me but for the shepherd of sheep there are no pre-arranged spots to wait. Left to their own devices a sheep keeps on wandering until it is found, joins another herd or is hunted down by a predator. For the shepherd this is part of the role as a protector and provider for his sheep. He cannot afford to lose any and will continue to search until he knows what happened to it. As believers we are a found people. We find comfort in being found but may soon forget that at one time we too were lost. We may not treat others who have not yet committed to a relationship with Jesus as being lost and in need of being found, preferring to stay with the found. There are many today who are wandering and need us to be as a shepherd to them, to find them and bring them into the Kingdom. We can be comforted that Jesus, our Good Shepherd, knows where we are all the time but until the lost hear and obey His voice calling them into the Kingdom they remain lost. And as we wander off occasionally are we in tune with the voice that calls to us to return? We need the heart of the Shepherd so that we do not merely associate only with the found but to go out and seek that which are lost. Every one of us in the Shepherd’s eye is a sheep that is important to the Kingdom. The Kingdom does not want to lose any as all have a role to play. The Father’s desire is to not lose any of the sheep and He along with the angels rejoice at every one that is found as Jesus taught in the parable of the lost sheep—- “Just so, I tell you, there will be more joy in heaven over one sinner who repents than over ninety-nine righteous persons who need no repentance.” Luke 5:7 This is part of the identity of who we are as His children, a sheep gone astray that has been found. The Lord and the angels rejoiced as we each came into the Kingdom. That ‘they rejoiced’—well now, that IS something to think about. The mention of ‘shepherd’ in scripture ranges from 40-58 times depending on the translation not including the plural and other forms of the word. The mention of ‘sheep’ occurs 189 times. Given the sheep raising of the region that the biblical account is written in it should not surprise us that the imagery of shepherd and sheep is used to describe the human condition. The best known scripture of the shepherd of course is the 23rd psalm which resonates with all because it is comforting. It provides for us a good understanding of just what the shepherd does for his sheep and by extension what the Lord Jesus does for us as our Good Shepherd. Out in the fields the shepherd, because they are often on the move from one place to another, is provider, protector and guide. He ensures green pasture is found so that the sheep can graze and rest. He protects not only against predators but also serves as the vet. He knows each sheep intimately. He leads or guides them with his staff as sheep cannot be driven like cattle. Without the shepherd, the sheep can get into all kinds of trouble. 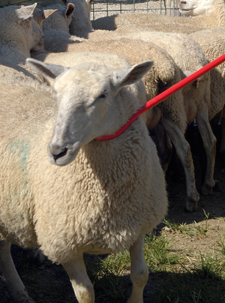 Cattle can be left to their own devices; sheep cannot unless they are in a pen. For those of us who live on the flat prairie there is a tendency to wonder just what kind of trouble sheep could possibly get into. However, the terrain of the biblical sheep is hilly with deep ravines and crevices that they can fall into. Sheep have been known to be found in the few trees that are there in an otherwise barren landscape. Sheep are not obedient unless the shepherd with his staff prods, pushes and comforts in times of stress. When used to describe the Israelites these are metaphors for the pitfalls that humanity is prone to and how the Israelites often lived their lives, going from one crisis to another needing provision, protection and guidance from the Lord God much as the sheep do under the care of a pastoral shepherd. As Jesus went throughout the cities, and villages He was filled with compassion for the crowds who were harassed and helpless, “like sheep without a shepherd.” (Matthew 9:36) He told his disciples to pray for labourers for the harvest. These were people who needed a shepherd, Jesus yes but also for other believers to lead the people to salvation. Jesus is the Good Shepherd but He couldn’t humanly get to all who needed Him so others were needed to help shepherd the people. We also need shepherds in our lives, to provide, to protect, to guide. Parents fulfill this role when we are children but as we go out on our own we still need shepherds as we too can wander aimlessly unaware of the ravines and crevices that we can fall into, traps set by the evil one in the hopes of keeping us away from God’s blessings. Even as we are shepherded we can at the same time shepherd others. Some are content to be the sheep but Jesus looks for shepherds to serve as provider, protector and guide. However, we must not forget that first and foremost we must learn from the Good Shepherd himself. Give Life while you live life! As much as I hate to admit it, summer seems to be winding down. I have so enjoyed my time spent outdoors–soaking up the sun, watching some beautiful sunsets, and enjoying time with family and friends. This summer has been extra special because I have really tried to embrace the challenge Pastor Chris gave us back in June–to Give Life to people around us. Pastor Chris encouraged us to focus on the verse from John 10:10, “I came that they may have life and have it abundantly.” All around us there are people who don’t know who Jesus is and therefore don’t experience the abundant life that He promises us. They pack our groceries, pump our gas, help us when we are sick, live next door to us and may even live in our homes. And they are living in a world that is often pretty lonely and cold. But Jesus promises us that there is so much more to life than that. The abundant life is a peaceful life, a settled life, a contented life, a life of freedom from worry. And He wants us to give that life to others. In Titus 2:7, we read, “And you yourself must be an example to them by doing good works of every kind. Let everything you do reflect the integrity and seriousness of your teaching.” This verse could be our anthem as we go out into the world and “Give Life” to the people we encounter. So how do we do this on a practical level? We can pray for the people we meet. A writer once said that people may reject our message, oppose our arguments for Jesus, and despise us, but they are helpless against our prayers! In 1 Peter 4:7, Peter says, “be earnest and disciplined in your prayers.” We all know people who have not yet said yes to Jesus. We can give life to these people by praying for them. In this same passage, Peter also says, “continue to show deep love for one another for love covers a multitude of sins.” v8. When we show love to the people around us, they notice. When we stop and talk to someone we don’t know–someone who serves us at the grocery store for example, and when we take an interest in their lives, remembering them each time we see them–that has an impact. When people see us showing love, it can be a way of changing their behavior too. When others see us living lives of generosity and kindness, maybe they will be moved to do the same. When they see us treating others with respect and love, perhaps they’ll be similarly motivated. The best weapon the church has to offer the world–except of course for Jesus–is our willingness and our desire to care for the needs of others. That is really what giving life is all about. It is about watching for the opportunity to see needs wherever we go, and then stepping into the gap and meeting them however we can. Over this summer I heard so many encouraging stories of people giving life this way. Babysitting for a family in crisis, helping in a medical emergency, buying food for folks in need, taking time to offer encouragement, talking with people and listening to their stories. It was exciting to be a part of what felt like a movement in action! Maybe you are reading this and thinking to yourself, “what’s so special about all of this? Isn’t this the way we are supposed to live when we follow Jesus?” And of course if you are thinking that, you are right! But do we? Am I the only one who gets so caught up in my own world, that when I’m out and about I barely notice the people around me? I don’t think I am the only one. Even though we should be different from the rest of the world, are we always? In 1 Peter 2:9, Peter writes that we are to be different because we are God’s very own possession. I love the way the King James version calls us “a peculiar people”. The world certainly sees us that way. So as peculiar people, we can live out this calling by giving life to the people around us in small and big ways, as we live our lives. That’s how it starts. It ends with us bringing glory to God through Jesus Christ.